We strongly recommend using oil based solvents to clean guns using Blackhorn 209. Typical solvents for muzzleloaders are water based and are not recommended. Water based solvents will create gumming and is difficult to remove. 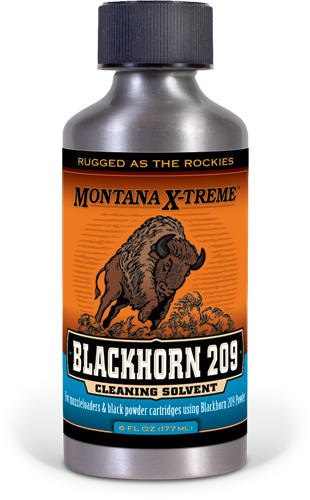 We recommend Montana X-Treme’s Blackhorn 209 solvent which is specifically designed to remove Blackhorn 209 residue. We also recommend Montana X-Treme’s Bore Conditioning Oil treatment. Bore Conditioning Oil will help reduce fouling, including sabot fouling and reduces cleaning time. Run 2-3 suitable size patches soaked in Blackhorn 209 solvent through the bore. Use a Montana X-Treme nylon brush soaked with Blackhorn 209 Solvent to scrub the bore. Follow with 1-2 dry patches and repeat steps 1 and 2 is necessary. To further protect the bore, add a small amount of Montana X-Treme Gun Oil, or Montana X-Treme Bore Conditioner Oil, to a patch and run it through the bore. ALWAYS ensure that any excess oil is removed from the barrel before firing. 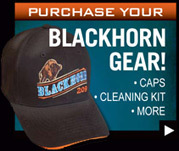 Blackhorn 209 Cleaning Solvent is specifically designed to clean firearms that shoot Blackhorn 209 Propellant.